Reviewing the Heart of Country Music. I am in a mood. I don't want the television on - polluting me with all of it's negativity. I'd rather listen to some music. Only trouble is, I'm tired of the local radio stations that play the same songs every hour. When I'm in this mood, a song that I love quickly becomes a song that grates my nerves due to the repetition. Today, I'm in the mood for a specific type of song, a country song that makes me feel good. So I turn to a familiar website for inspiration. Since you may not be familiar with Drageda.com I thought I'd do a quick site review and introduce you. Our very own Review This! contributor, Barbara Tremblay Cipak (Brite-Ideas) is the creator of Drageda.com. I am not writing this review because she is a co-writer on this site. Rather, I am writing this review because I truly find her personal website to be heart-felt, informational, and helpful. 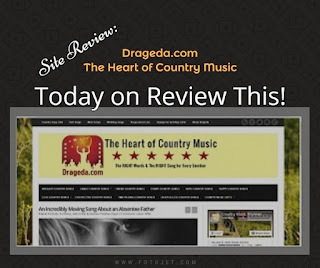 Drageda.com is "not your typical find a country song site". Barbara has created the site to assist with finding the right country song for your feeling, special occasion, or that particular moment in your life. Whether it is a birthday, wedding, or memorial.... whether is about family, friendships, love, break-ups, or grief and loss... Barbara reviews and categorizes songs to fit the moment in time. What in the world does Drageda stand for ? Drageda stands for Don't Ride Alone Get Emotional Daily Assistance. Even though I listen to country music (I like many genres, and am a radio station surfer, but I tend toward country the most), Barbara's reviews have introduced me to new artists and new songs. All of her reviews are heartfelt. She provides the links to the music or videos, her interpretation of the songs, and portions of the lyrics. The site is easy to use. There are a variety of categories that are easily accessible via the links at the top of the page. This includes the categories: Breakup, Family, Friend, Funny, Hope, Happy, Love, Perspective, Time Passing, and Death & Loss. There is also a Country Gifts category. Some of those categories have sub-sections. Cheater: Support songs if the MoFo cheated! In addition to the specific Drageda.com song reviews, on the right side of the page, there are two itunes sections that list the current top 10 country music videos and the current top 10 country music albums. Using those sections, I have found songs/videos I wasn't familiar with and because that section links to itunes, I am able to listen to song samples for free (I really like free). Finally, and sometimes most importantly to me, there is a noticeable absence of ads and pop-ups. I really find those "subscribe" pop-ups, ads, and websites that are as full of ads as they are content so annoying that I'll sometimes immediately click out of a site. I appreciate that Barbara (whether intentional or not) is so focused on the feelings of the music and the music itself that disruptive ad placement is excluded. What a breath of fresh air these days. There is only one small addition that would be helpful for me personally on Drageda.com. That would be a section just for music that celebrates country living and the natural world. When I'm in this mood, that is the music I lean toward. However, even without this specific section, I was able to find the perfect song (and it turns out an entire album) that fits my mood today. Celebrating "country" and the natural world. This is probably a song I would not have found without help from Drageda.com. I'm glad to have found it. My home is filled with feel-good music and songs that fit my emotional needs for today. Just how Drageda intended.